Tutorial: What's wrong with my cannabis plant? 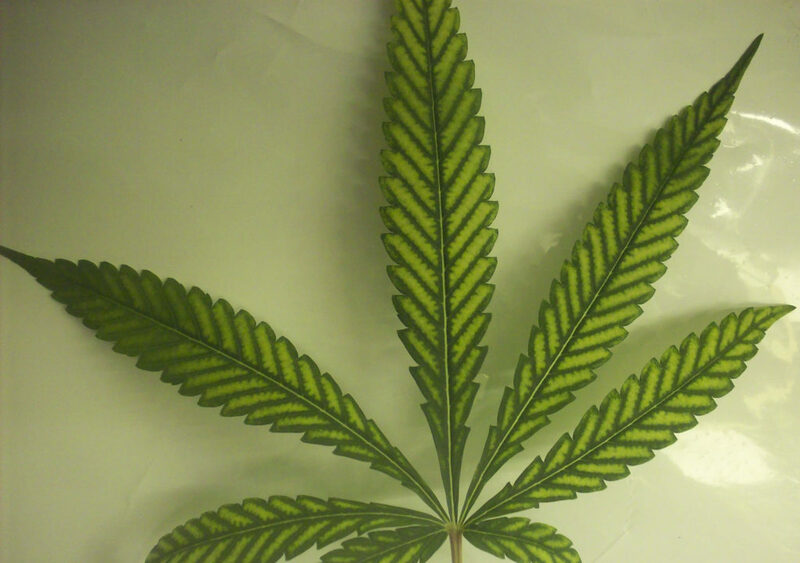 Home › Blog › Cultivation › Tutorial: What’s wrong with my cannabis plant? Tutorial: What’s wrong with my cannabis plant? 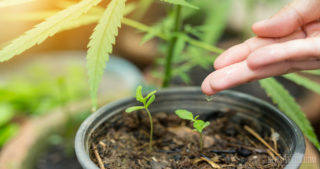 Tips A cannabis plant is hardy, but like any other species, its health and vigour will be negatively impacted if it is deprived of essential nutrients. If this is not corrected, it can cause plants to stop growing or even die. Deficiencies in cannabis can be hard to identify, so we have compiled a basic list of what to look out for if things go wrong. 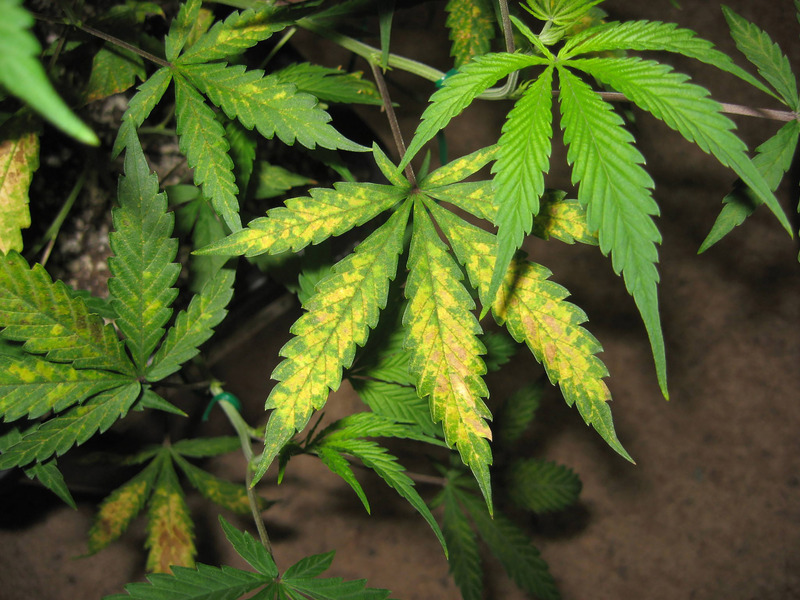 Nitrogen deficiency is probably the most common deficiency reported by cannabis growers. It is one that is usually easy to identify and correct as soon as it becomes apparent, although it shares a basic resemblance to several other deficiencies in the early stages. 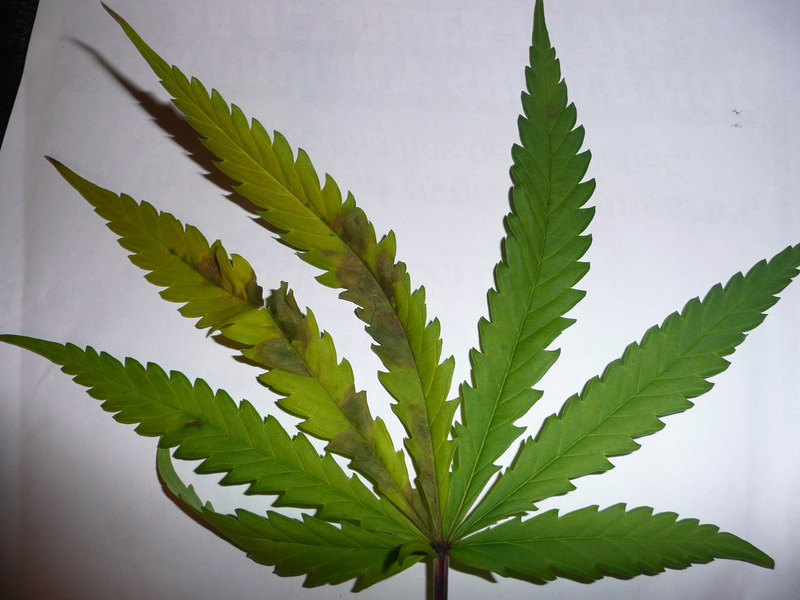 In the early stages of nitrogen deficiency, leaves appear to be too light in colour—almost yellowish-green—compared to the desired deep green of healthy leaves. Nitrogen-deficient leaves also typically have slightly darker veins compared to the very light colour of the leaf tissue itself—although the contrast is not as marked as in some other deficiencies. Conversely, nitrogen toxicity results in leaves taking on a very dark green hue that can look almost black in extreme cases. In severe cases of nitrogen deficiency, the leaves appear lighter and lighter in colour, and eventually begin to dry out and die. Commonly, the larger leaves on the lower and outer parts of the plant are the first to be affected and the first to die. If nitrogen deficiency becomes apparent in the later stages of flowering, it does not need to be corrected; indeed, it is natural for the older leaves to drop off and die at this point as they are no longer needed. 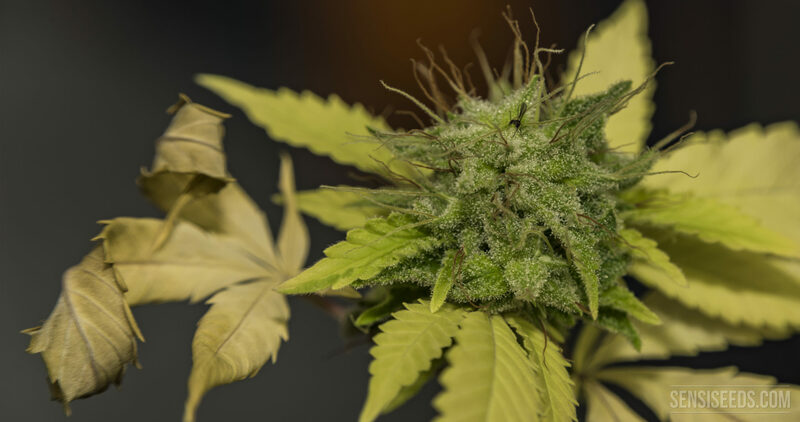 However, a nitrogen deficiency in vegetative growth or early flower can severely impact overall yield and quality, as it affects the plant’s ability to photosynthesize energy. Nitrogen deficiency can usually be corrected by simply increasing the strength of your normal NPK-based feed, but if fine-tuning is required then nitrogen-only additives are not hard to find. Phosphorus deficiencies are rare, but can be hugely problematic. If affecting plants in the vegetative stage, it can cause reduced growth rates, small leaves, weak roots and plants that are generally lacking in vigour. 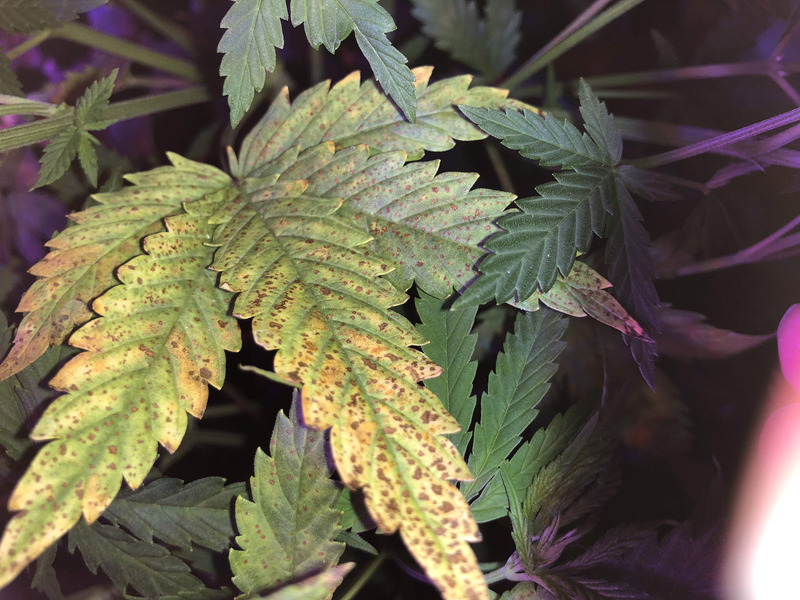 In the early stages, phosphorus deficiency usually causes leaves to appear dark but washed-out, with very dark veins and somewhat lighter leaf tissue. As it progresses, purplish discolourations begin to appear on the main part of the leaves, and the leaf edges begin to turn brown and curl downwards. The leaf petioles (the small stalk attaching the leaf to the main stem) may also begin to turn a purplish colour. In the final stages, large patches of the leaves become purplish-brown and dead, while the remaining sections turn mottled yellowish-green. Again, phosphorus deficiencies usually affect the outer, lower leaves first. Unlike nitrogen deficiency, phosphorus deficiency at any stage is cause for concern, as the plants continue to require high levels of phosphorus throughout the flowering period. Potassium deficiencies are particularly rare in hydroponics systems, but somewhat more common when growing in soil or a planting medium. Potassium deficiencies often arise when there is too much nitrogen or calcium in your chosen medium—which can make it difficult to correct with combined-nutrient feeds. It is therefore advisable to correct potassium deficiency by reducing levels of nitrogen or calcium, and using a single-nutrient potassium additive if the problem persists. Checking pH and flushing your plants with half-strength nutrient solution may also help. In the early stages of potassium deficiency, the edges of the lower, outer leaves begin to turn pale yellow, while the veins remain green. The leaf tips and edges may become dry and brown and begin to curl up or down. As the deficiency progresses, brown, necrotic spots begin to appear all over the leaves, and the edges take on a dry, scorched appearance. New leaves may become twisted and misshapen, and older leaves will begin to drop off. Plants may also exhibit stretching (with large gaps between internodes) and in the flowering stage, buds will not put on weight as rapidly as in normal conditions. 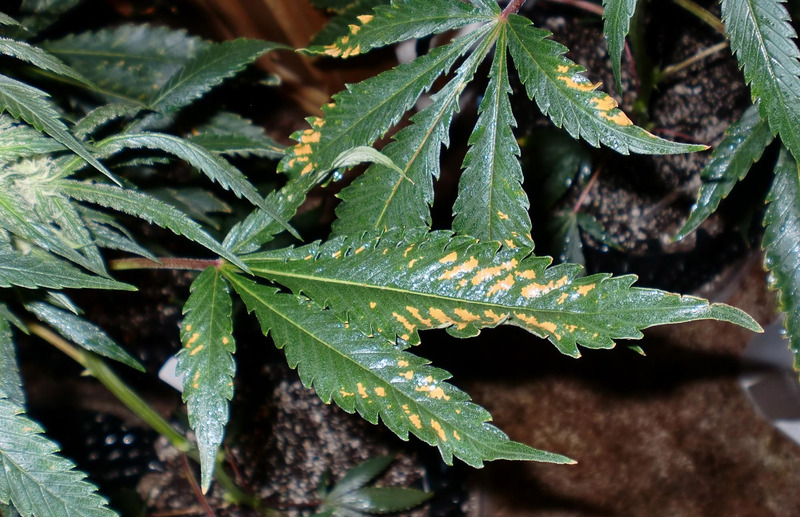 A magnesium deficiency can appear very similar to potassium deficiency—in the early stages, the leaf edges begin to turn yellow while the veins remain dark. As the deficiency progresses, the leaf edges start to dry out and curl inwards; the upper leaves will also become affected until eventually even new growth is pale and chlorotic (lacking in chlorophyll). Brown spots may also appear on the lower leaves before they begin to drop off and die. Magnesium deficiencies are relatively common, and can usually be corrected by adding magnesium sulphate or Epsom salts to your feed. Sulphur deficiency looks a lot like nitrogen deficiency in the early stages, as it causes the entire leaf to be pale and chlorotic, with very slightly darker veins. 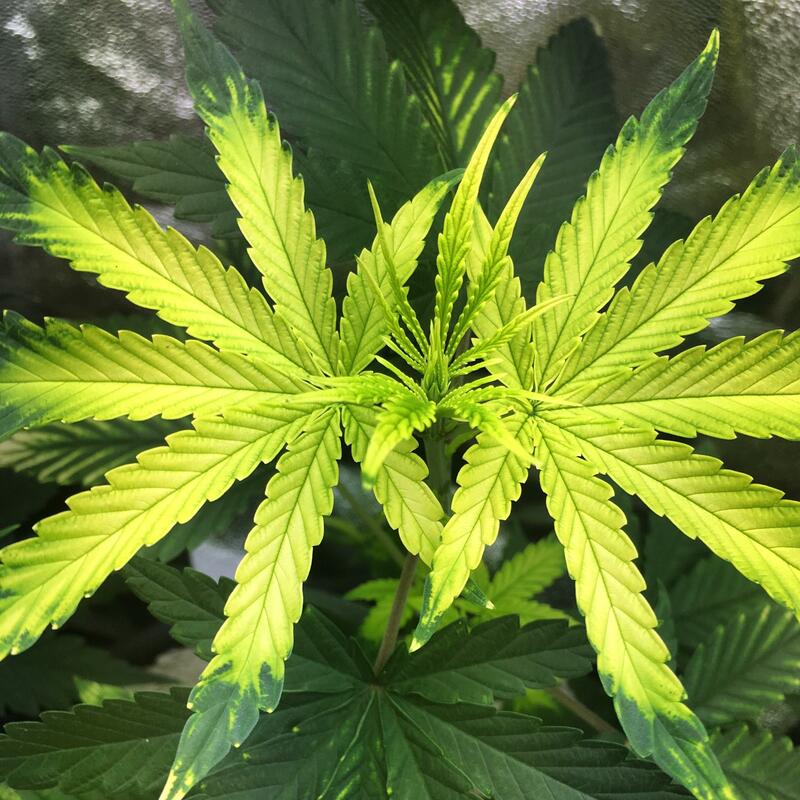 However, sulphur deficiency usually affects the newer leaves first, unlike nitrogen deficiency; it also affects the back of the leaf first before progressing towards the tip, unlike many other deficiencies. As the deficiency progresses, leaf tips and edges may begin to turn brown and dry; this effect is often much more subtle than with other deficiencies causing the same symptom. In the final stages, the entire leaf appears whitish-yellow, and older leaves will begin to drop off. Sulphur deficiencies are quite rare, and can usually be corrected by adding Epsom salts to the feed. Manganese deficiency is also rare, and shares several points of similarity with sulphur deficiency. In the early stages, leaves will begin to yellow, leaving slightly darker veins. The yellowing often occurs at the base of the leaf, before spreading out towards the tip. As the deficiency progresses, brown, necrotic spots will begin to appear all over the leaves; these spots will spread throughout the plant if it is not corrected. Manganese deficiency is usually corrected by adjusting pH and ensuring that iron is not present in too high a concentration. Iron deficiency is also rare, and shares several features with other deficiencies. Like sulphur or manganese deficiency, the base of the leaf is often affected first; like sulphur deficiency, the newer leaves are often affected before the lower leaves. Like magnesium deficiency, the colour of the leaves can become extremely light yellow or almost white in appearance. Sometimes, the leaf veins remain darker green, but in many cases of iron deficiency, the veins become yellowed and washed-out in appearance. Iron deficiencies are often caused by overly high (basic) pH, and can be corrected by flushing your medium with clean pH’d water and if necessary, adding an iron supplement. Iron can react with various other nutrients and cause problems of its own, so it is important to tread carefully and observe all changes very keenly. Hi sensi seeds having big problems trying to complain about purple bud seeds i bought they are not purple trying to contact costumer service department but i don't think you have one as i am being sent round in circles. 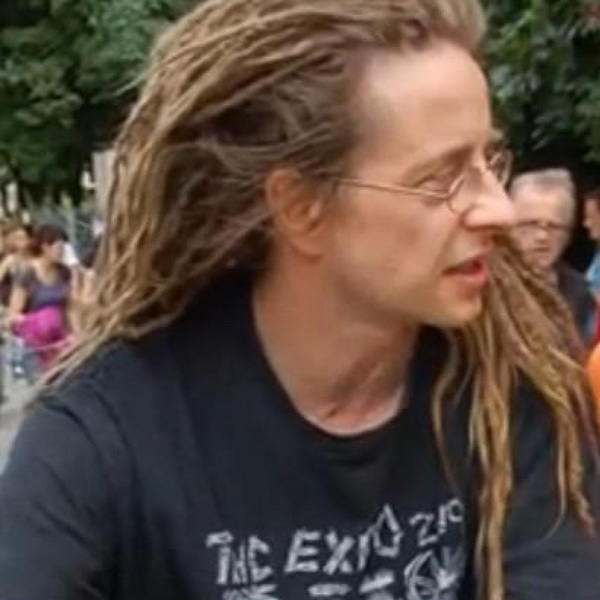 Await you contacting me i have been a loyal costumer for a couple of years.Sean . Hi bought purple bud seeds and they finished and have not turned purple what's happened sensi.? 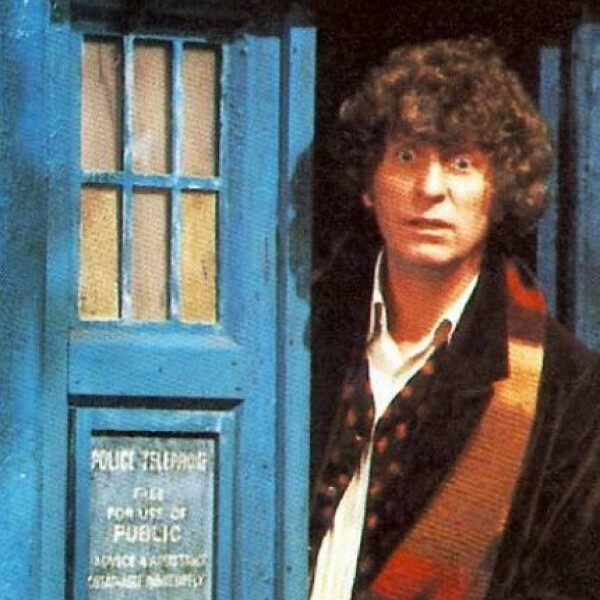 i realy LOVE IT ,and i did have some of the "problms"you talk about on yor cronicle,i did correct im on time,(well ,in reality was a friend(so now im by my one this year,and i wold love (if possible)have more information. !thank you ..........!ho ,im just a early stage beginner as a grower ,if that help.?!!!!!!!!!!!! !thank you! Please feel free to discuss this in our Sensi forum: http://forum.sensiseeds.com/. Users there might be able to help with your questions. mine also had no purple?? I just thought it was me? no like your description? Definitely starting to experience an iron deficiency on my 3 month old. ,is about a reddish color that is starting to form on the same leaves that are showing the iron-D, almost as if someone has been trying to make a picture of a weed leaf look 3-D with an air-brush that has red paint in it. It's not on the top veins, but there's a similar color on the underneath of the same leaves on the veins, but it's all quite faint looking right now. ,I just couldn't find anything regarding the combination in question. if everything goes well this strain whats the total time. from the seed to harvesting. average 3 months less or what? Can someone help me with a problem? I have purple bud,it’s not autoflowering so my question is does a feminized cannabis need a male plant for flowering or is it just like autoflowering? 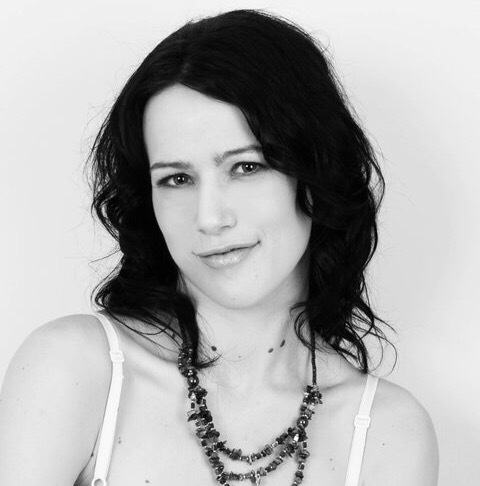 For legal reasons, I cannot give grow advice, but I can answer your question. Feminized cannabis plants will flower just fine on their own. Males are really only necessary for fertilizing the flowers to produce seeds, although this article does have more information on male plants which you may find interesting. Finally! Some good pics with great descriptions. Thank you for that. However, I was looking for an answer for a plant stock going relish/purple. I figure it must be some type of lock-out or deficiency. Or too much of something. Ideas? what this could be or cause? Thank you for your comment and positive feedback! 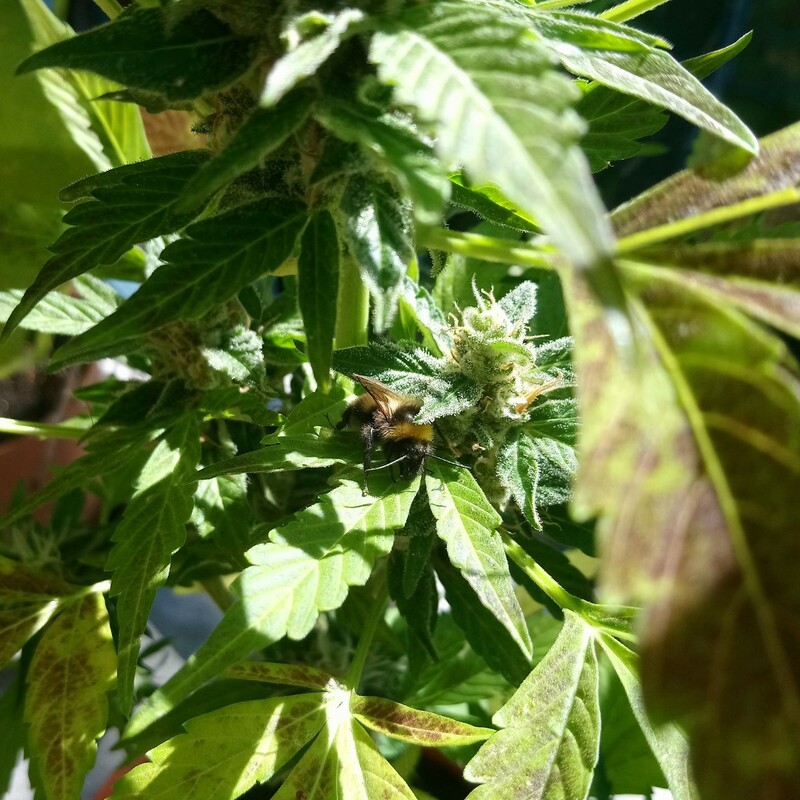 It's always good to hear that we are helping people :) Unfortunately, for legal reasons, I'm not allowed to answer cultivation questions on the blog, but this post has a lot of information on the various reasons that cannabis turns purple. 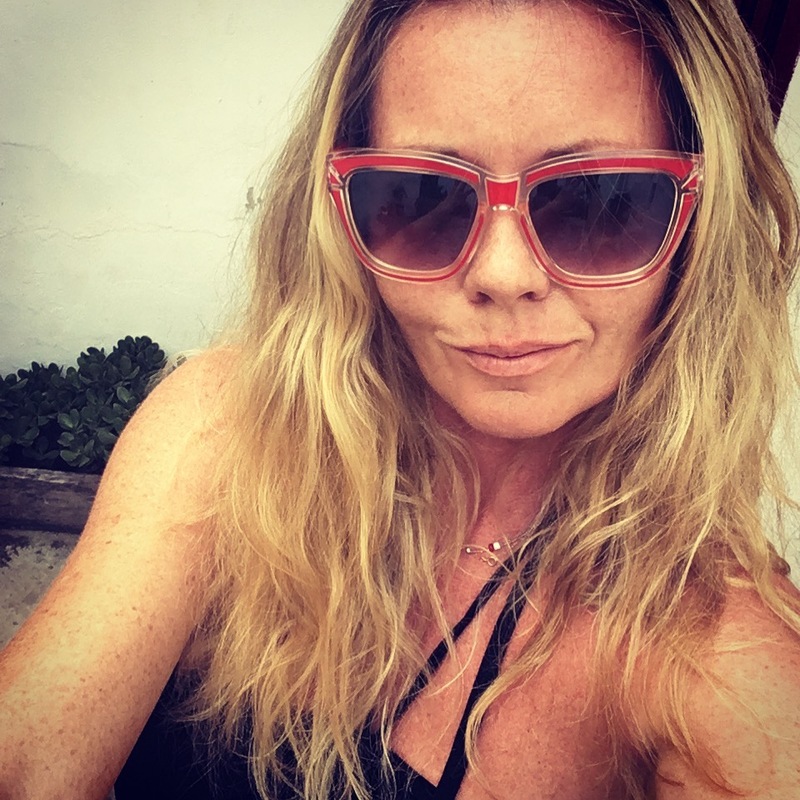 I hope it is helpful, and that you continue to enjoy the blog. 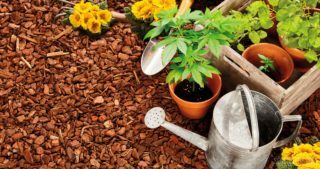 The outdoor gardener is at the mercy of the elements and whatever nasty surprises Mother Nature may like to throw at us, such as moulds, diseases, and of course, insect and animal pests. 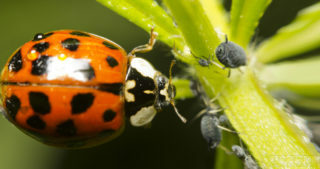 Here, we focus on some minimal-impact, environmentally-friendly ways to control pests outdoors, so you can avoid use of heavy chemicals. Companion planting for cannabis may be one great asset for the everyday cannabis enthusiast, but whichever plants you are growing .. do them a favour, and provide them with an environment as natural and as supportive as possible. 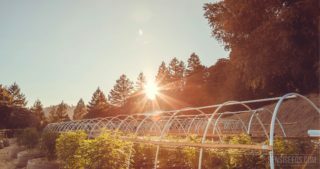 How do you make your growroom more eco-friendly? Something that is often a cause for concern among many fans of cannabis – perhaps because we tend to be more conscious of the importance of plants and the beauty of the planet we live on – is the environmental impact of indoor growing. 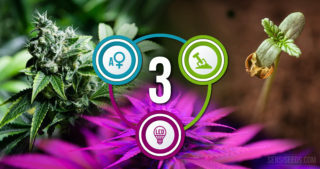 Here Sensi Seeds presents three tips for creating a greener growroom. Can Craft Cannabis Save Cannabis? The term ‘craft cannabis’ originated in California to describe sun-grown marijuana farmed sustainably to produce potent bud. By adapting the farm-to-table restaurant model, forward-thinking brokers created a seed-to-shelf service to supply dispensaries with top shelf flower, and promote craft cannabis. But is it a gimmick, or a bid to save an industry in crisis? 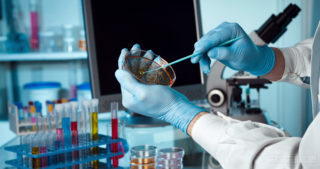 Will we now see cannabinoids produced from genetically modified bacteria? Unlike in Europe, the public in the US and Canada appear relatively unconcerned about so-called genetic engineering. 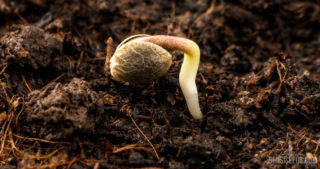 The first GMO companies are now starting to look at improving the ancient medicinal and crop plant Cannabis sativa L.
Correctly preparing the soil for an outdoor cannabis garden can make all the difference to the quality and size of your eventual harvest. Cannabis has specific requirements in terms of soil quality and texture; here is a brief guide to ensuring all variables are optimized. In this chapter we examine the role of mineral elements and their importance for plant metabolism. So as not to overwhelm you with information, we have decided to divide the explanation into two parts. In the first part we will talk about macroelements and their importance. 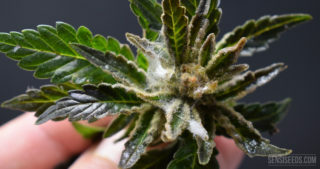 There are few things worse than lovingly nurturing a crop of cannabis through vegetation and flowering, only to have mould strike in the last weeks before harvest. 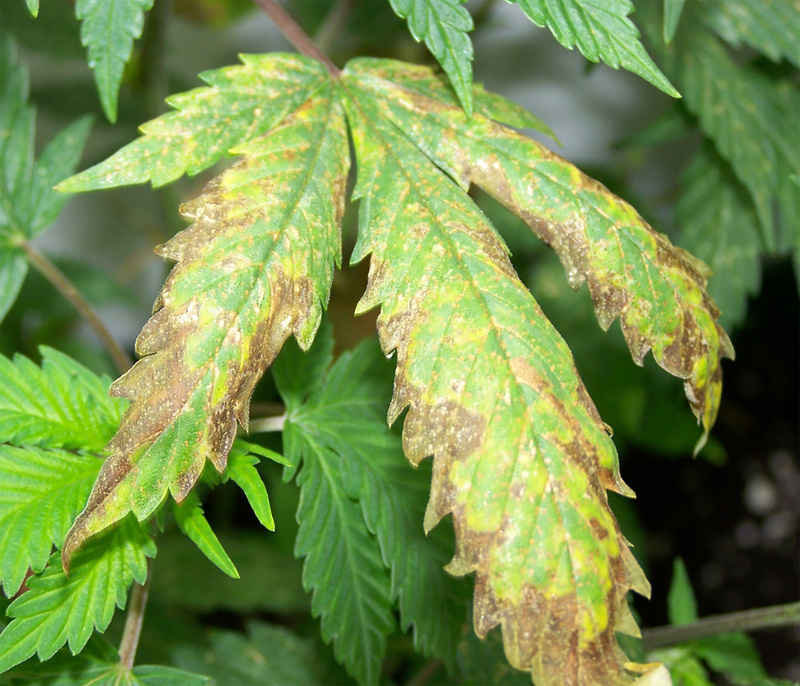 Unfortunately, this span of time is exactly when the most common types of cannabis rot and mould infections usually occur. Knowing the reasons for this also suggests how to prevent them occurring.